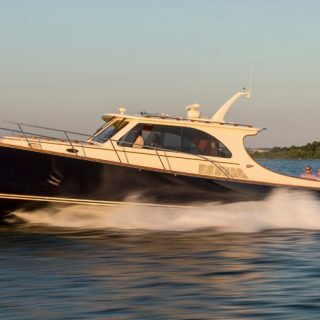 If you’re looking to do some long distance cruising on one tank, we’ve got the boat for you! The Talaria 43, launched just last year, was built with fuel efficiency in mind so you can go further, faster, and more economically. And with a fuel capacity of 500 gallons, this means you can make serious tracks! The benefits are obvious; a fuel efficient yacht creates less of an impact on the environment and can save you money in operating costs. With today’s modern diesel engines, that efficiency is built in. However, that didn’t stop the Hinckley engineers from striving to design the best hull possible. This begins and ends with our precise laminate engineering that results in a light, fuel efficient hull. Built with DualGuard® composite construction with a Corecell M Foam core and carbon fiber inner skin, we don’t sacrifice strength in our pursuit of lightweight materials. The Talaria 43 with an optional upgrade to 650 horse power engines can go 30 knots while only burning 43 gallons per hour. To put that in perspective, you can leave our Portsmouth service yard and get to the mouth of the Chesapeake with 150 gallons of fuel to spare! Just going on a sunset harbor burn or watching the kids compete in junior sailing? Cruising at 9 knots burns 4 only gallons per hour! And if that wasn’t enough, this option increases the top speed of the yacht to 37 knots.